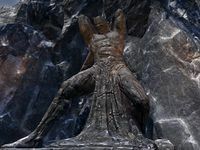 The Malacath Statue is a statue found northeast of Orsinium. Behind it is a crafting station where the Trial By Fire set can be crafted. The collision of the statue does not match its look. ?